Crescendo Electrical Services Ltd - Alarms/Security, Electrician based in East Grinstead, West Sussex. 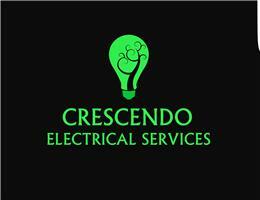 Welcome to Crescendo Electrical Services Ltd. I'm Charlie Kebbell the director of my company. I have 12 years experience in the industry and am fully qualified. I cover Surrey, West Sussex and further. I'm a friendly, reliable and tidy workman and take huge pride in the work I do. Please call for a no obligation quote and I'll be happy to assist you.